I love this old fashioned homemade apple cake recipe. It produces a moist apple cake that is divine with my warm homemade caramel sauce. I offer my favorite homemade cake recipes and more easy dessert recipes to try at the bottom of the page. 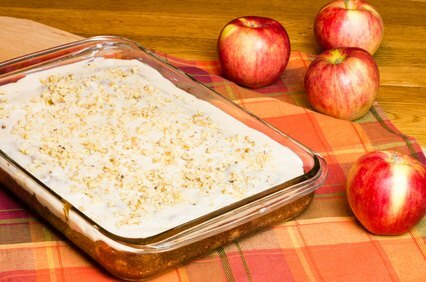 You can make this wonderful moist apple cake as spicy as you want. PREHEAT oven to 350 degrees. Grease and flour a 9" cake pan. Sift together the flour, baking powder, baking soda, salt, cinnamon, nutmeg and cloves; set aside. In a large bowl, cream together the shortening, brown sugar and white sugar until light and fluffy. Beat in the eggs one at a time; mixing well after each addition. Stir in the vanilla. Beat in the flour mixture alternately with the milk, mixing just until incorporated. Stir in the chopped apples. Spread batter evenly in prepared pan. Bake for 35 to 40 minutes, or until a toothpick inserted into the center of the cake comes out clean. Allow to cool. In a medium bowl, combine 1/4 cup shortening, confectioners' sugar, cinnamon and nutmeg. Beat until light and creamy. Add the milk, one tablespoon at a time, until desired spreading consistency is achieved. Spread over top of cooled cake. Instead of frosting, you can use my homemade caramel sauce. It's scrumptious. In a saucepan, combine sugar, flour and milk until smooth. Bring to a boil over medium-heat; cook and stir for 2 minutes or until thickened and bubbly. Remove from the heat. Stir a small amount into egg; return all to pan and bring to a gentle boil. Reduce heat; cook and stir for 2 minutes. Remove from the heat; whisk in butter and vanilla. Serve over warm cake. Sprinkle with crushed walnuts, ground cinnamon (or cloves) if desired.